A demountable container system (also known as a Hook Lift) is a hydraulic lifting system which is mounted on the rear of a truck. The hook is positioned on the ‘A frame’ of a container and pulled and lifted into place onto the chassis of the truck. The system also allows the option of tipping the container if required. The hydraulic controls are generally operated from inside the cab, although there are controls on the side of the vehicle which operate the sheet which is used to cover the contents and prevent material from being blown from the container when travelling on the road. Sussex Forklift Training conducts training on a variety of containers they can be used for bulk refuse, builders’ waste, recovery vehicles, shipping containers and fire brigade response units. This course is designed to train the operator in operating the equipment only. 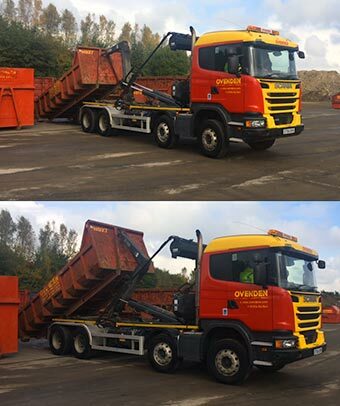 It is not designed to train the operator to drive or manoeuvre the vehicle, nor is it in any way designed to meet the standards of the LGV Driving Test. Training on the Demountable Container Unit can only take place at customers' premises.